How did you get into agriculture? I am the 4th generation to grown up on my parent's goat and sheep property, Kimberley Station, south of Broken Hill. Education: Finished high school and went out to work. Later with the support of my employers and SA ICPA completed my Cert. 3 in Education Support. What are/were your plans after school/tafe/university? After school I just wanted to head back to the outback where I felt I belonged. Over the last 14 years I have mostly governessed for outback families in SA, QLD and NSW. I have also worked on stations for family and friends doing all sorts of Jillaroo work. 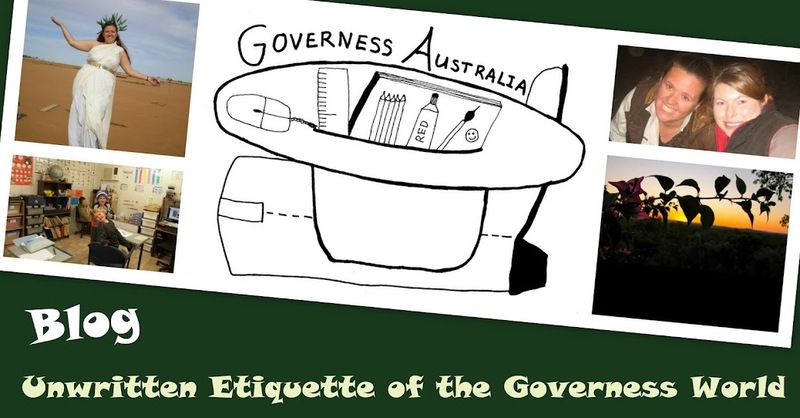 Since 2002 I have run a website called Governess Australia. I have turned this into a business which I consult on governessing and advertise governess and outback jobs for rural families. Describe your job on the average day: My average day as a governess begins at about 8am when I head to the schoolroom to get organised for school. The kids arrive and so begins a day of fun, madness and learning. This includes air lessons, completing work booklets in all subjects, art and PE. My work day ends normally at around 3pm but in busy times it can change as I have to be flexible and chip in where needed. After I finished governessing for the day I then get on the computer start going through emails and attending to my website Governess Australia. This includes updating my Facebook pages, blog and twitter account. Social media plays a big part in this business. What is your favourite part of your job? The fun and laughter of working with bush children. Going to school events and swapping stories with other outback home tutors. Molding young minds is the most amazing experience ever and when they understand something you know you have given them something for the future. What are your interests? I love technology, gardening, cooking and relaxing with friends. Working out on the property at home. Solving problems and improving things. What’s your favourite thing about the industry? I love as a governess and as a small business owner meeting, helping and chatting to people in the outback. I love hearing rain on a tin roof and seeing the land replenished. I love the extremes of Mother Nature in bushfires, floods and famine ... one way or another we are begging her to be kind to us. Best experience in agriculture? The people are amazing, caring and often treat you like you are family. The views are amazing and can leave you with a new understanding of nature. Worst experience in agriculture? Being stuck up a tree while an emu circled the base. Very funny incident. It took a while for the emu to become bored and realise I wasn't attacking his chicks. He then wandered off. It would have made an interesting photo. In the bush all experiences help you learn, none are that bad. What do you think will be the biggest challenges of the agricultural industry in the future? If all the farmers start leaving the land... Who will care for each acre, who will grow food to eat, who will make sure that nature is in balance? If the land is run by ignorant people sometimes nature suffers. The best of intentions don't always produce the best of environment. Why do you think less people are becoming involved in agriculture? Money being offered by mines may seem more attractive even if the life of a shift worker isn't. People hear so much bad media about working and living in the bush that until they get out there they don't realise that most is propaganda. People see all the work and don't realise the reward from working in Agriculture. It just gets in your blood. What advice do you have for people thinking about getting into agriculture? Make the leap you will never look back. It will be an experience you remember for the rest of your life. Be open minded and be prepared to meet interesting people. How important do you think an agricultural background is to become involved in the industry? While I do have an agriculture background it is not important. It is about having a go and being will to learn. It is about being self motivated, having plenty of patience and humour. What do you think is the most common misconception about agriculture? That we are hicks from the sticks and are looking to destroy/take from our land. When living on a property it is important to understand nature and know the balance for your land. For us to survive we need to improve and conserve our land and animals. Another misconception is the fact that most water points across Australia are now man-made and thousands of years ago the native animals would not have been able to over breed or live in these areas as there was no permanent water.